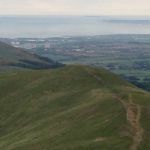 The date was Monday 5th June, the time was 6:35pm, a mere 5 minutes after the scheduled arrival time, and 24 intrepid souls were on their way from Flotterstone car park to start their chosen route to run along the Pentland Hills skyline. 19 of these folks were from ESOC, 3 from Interlopers and 2 from Roxburgh Reivers. Fran had ably, or perhaps formidably(! ), sorted everyone into cars to get them to their starting point using the minimum number of cars, since everyone would be running back to Flotterstone. 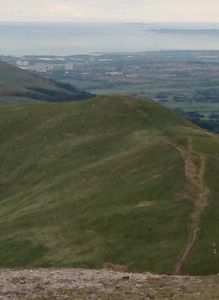 14 people opted for the full run from Nine Mile Burn back to Flotterstone (a distance of over 11km), 6 people opted for the shorter 6/7km route via Old Kirk Road and the remaining 4 opted to set out from Flotterstone to walk run/walk their chosen distance then head back along the same route. 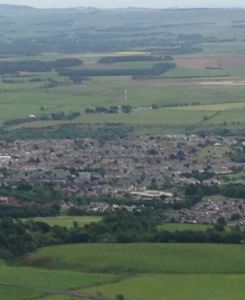 The weather held for the duration of everyone's run and it proved to be a fine evening for hill running, much better than earlier when parts of Edinburgh had been hit with a torrential downpour, with thunder just across the Forth in Fife. 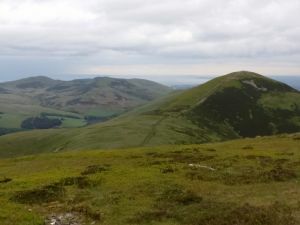 The Pentlands escaped this. 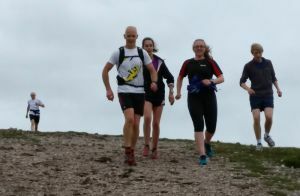 The downpour meant that Terry Johnstone decided to run to Flotterstone via the tarmac route instead of the hill route he intended to take. A lucky decision, as Janet Clark stopped to give him a lift for the last couple of miles, thus saving his legs a bit for the run. A bit weary, but otherwise in fine form, everyone was back at the car park by around 8:30pm, the scheduled time for those who had booked a meal at the Flotterstone Inn. A couple of other ESOC members joined us in the pub for the social element of the evening and a jolly time was had by all. There remained only the small matter of the displaced cars still at Nine Mile Burn - knights in shining armour were Ewart, Bill and Les who, at various times, ferried other drivers back to get their cars. Malcolm was the photographer for the evening. Huge thanks Fran for organising this for the Club.